Pre-school laptop with child-friendly click-tick mouse and 30 educational activities that teach early computer skills and age appropriate curriculum, including phonics, numbers, logic and moreFeatures moveable mouse for left or right handed users, carry handle for on-the-go play and comes with a workbook for additional learning. Encourages hand-eye co-ordination.Age 3 – 6 Years Batteries included…. With this colourful pre-school laptop from VTech, a friendly squirrel character is both the helper and friend that leads and develops play through a wide range of forest-themed activities. Combining fun activities with age appropriate curriculum, this kids laptop will encourage play, learning and computer skills. It even comes with a workbook for additional learning. Teaches phonics, letters and maths with 30 educational activities. Comes with a child-friendly 8-directional cursor mouse that encourages early computer skills. The mouse is for left or right handed users. Features a carry handle for on-the-go play. Encourages logical thinking, visualisation skills and hand-eye co-ordination. Size H29, W36, D9cm; Batteries required: 3 x AA (included); For ages 3 years and over; EAN: 3417761011034. WARNING(S): Not suitable for children under 3 years old. Only for domestic use. This toy costs approximately £14.99 (for the latest and best prices make sure you check our retailer list for the VTech My Laptop Orange above). 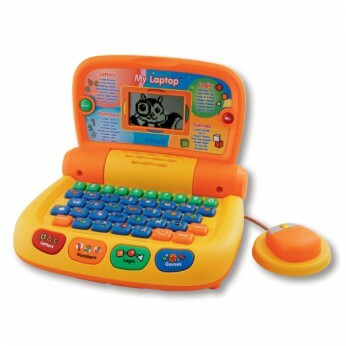 In our review of VTech My Laptop Orange we classed it as being suitable for ages 3 years, 4 years, 5 years but recommend you check the manufacturer specific advice before purchasing.